A combination of fine "non-abrasive" cleaner and wax. 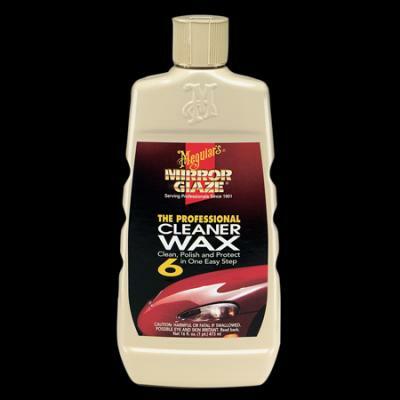 This product is perfect for the volume detailer when a very mild cleaning is required and quick turnover is desired. Meguiars calls this product an "non-abrasive" cleaner/wax. The point made is that it will leave no marks behind. This product can be thought of as a blend of M02, Fine Cut Cleaner, and M26, Yellow Wax, although they have not told the Doctor how they do it. Use this product with a medium grade foam pad. The Doctor recommends using this product when there is plenty of gloss left yet mild oxidaton as well. It's also great for spot imperfections like bumps or marrs. When there's no time for a two or three step finish, at least grab this cleaner and wax in one, and protect your baby. Consider using the clay bar first in case you don't need an abrasive. Cleaner/Wax's one-step application cleans, polishes and protects. Apply by hand or machine to remove light oxidation and create a long lasting, high gloss finish.